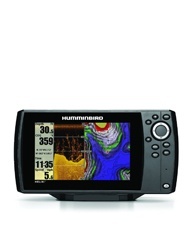 Humminbird is a company that has been on the market for decades, and that stands for something. They have been providing enthusiast and professional fishermen with top quality equipment for decades. They've also been on the forefront of technology aimed at fishing since the 1970s. 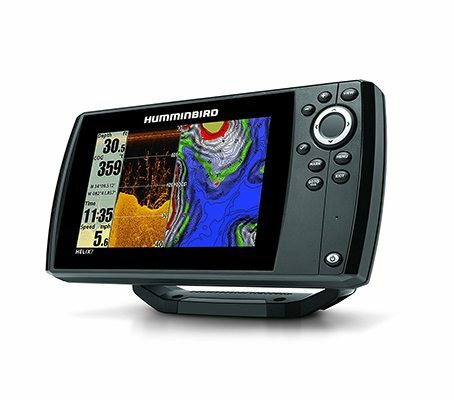 If there's one brand you should consider, it's Humminbird. That's why decided to review one of their more advanced models named the Helix 7 DI GPS Fish finder. The Helix 7 DI GPS is a powerful little machine, whether you're a professional angler or just an enthusiast that can't resist high tech gadgets. It has Down Imaging and SwitchFire sonar technologies, as well as GPS and a large color display. The Helix 7 has a 7-inch, 256 color TFT screen that's LED backlit. It comes with a resolution of 800 x 488. This display is in 16:9 format and is glass bonded for excellent clarity. With the screen oriented into landscape mode, you can fit more information onto the display.This screen is a major upgrade in comparison with the Helix 7 predecessor, the Helix 5, which has just a plastic lens. The display is bright and easy to read in various conditions, from direct sunlight to fog and nighttime. With this unit, you get the same resolution and screen size as the more expensive 800 series. The brightness and resolution of the screen help with Down Imaging. It reveals trees, rocks and fish that a traditional 2D sonar cannot. With more memory on board, this unit can refresh the screen faster and bring up maps without lag. That way you can cruise along in your boat while watching maps update in real time. As a result, the sonar returns are faster as well. Even at high speed, you won't have issues that sometimes appeared on the Helix 5 model. Unfortunately for the Helix 7, it doesn't have the ability to share GPS waypoints with other devices from Humminbird. Networking might be the most requested upgrade on various forums, but remains a feature of more expensive products from this manufacturer. In all fairness, it would add to the price of the Helix 7 significantly. This unit has a slot for Micro SD cards. The GPS comes with a UniMap basemap out of the box, with upgrades available through the Micro SD slot. With it, you can take advantage of HumminBird Lakemaster, Navionics Gold/Hot Maps as well as Autochart and Autochart Pro. With AutoChart, you can use your Humminbird sonar returns to build maps. Using a PC program, you can convert these charts can be into maps of lakes and rivers that you like to fish in. You can choose what you will use and get the most out of maps. That way you can find the best spots for fishing. Besides maps, you can upgrade and update firmware through the Micro SD slot. Humminbird offers free internal software upgrades whenever new updates are out. There's also the option to take screenshots of sonar recording reports, or even save waypoints for later use. This Helix model has precision GPS. It provides you with five updates per second and a position accuracy of 4.5 meters or 15 feet. This internal GPS uses EGNOS, MSAS and WAAS information for better results. With this unit's GPS, you can track the speed of your boat. There's no need to buy a separate speed probe for that. The GPS in this unit offers a track log function, waypoints, and routes. That way it can store up to 2,500 waypoints, 50 trails with 20,000 points each, and up to 45 routes. Unlike older models, the Helix 7 comes with an easy to adjust gimbal bracket. This bracket is a much better option than the old quick release parts. During our tests it was straightforward and easy to use. This unit includes Down Imaging and 2D Dual Beam Plus sonar. Down Imaging in conjunction with Dual Beam sonar and Switchfire offers high detail images. This is made possible with the use of sound waves broadcast in ultra thin slices at high frequency. These waves give sonar returns that put out an accurate image of what's hiding beneath your boat. This unit is only a DI capable device and does not support 360 or Side Imaging. When 2D sonar is in use, it runs two frequencies, 200/455 kHz. They have a 28° and 16° coverage with cone shaped beams. Down Imaging also uses two frequencies, 455/800 kHz. These use fan-shaped beams with angles of 75° and 45°. Down Imagine reaches 350 feet in depth, while standard mode offers 600 feet of depth. Selective Fish ID+ uses specialized sonar processing for interpretation of sonar returns. It can display a fish symbol along with a depth reading when certain requirements are met. There are three different fish icons that the display can show. They depend on the strength of the sonar return.